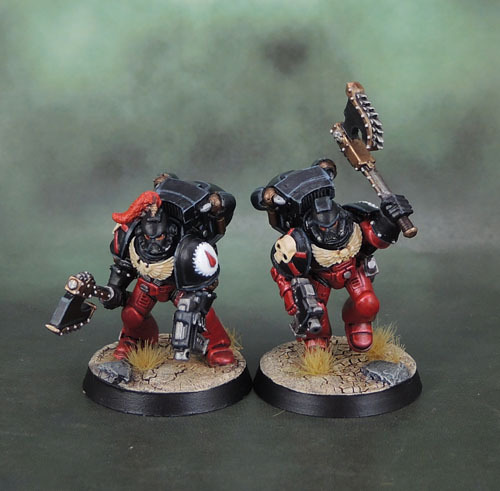 Flesh Tearers Space Marines Assault Squad (Squad: March ’18) | Azazel's Bitz Box. Here’s another squad, finally completed. I dug these guys out of a figure case several months ago and have been slowly plugging away at them pretty much ever since. I’d completed them except for the Jump Packs in January, so with the squad-based focus this month, I was able to get motivated to finally finish them off! My Flesh Tearers take a few deviations from the official scheme. 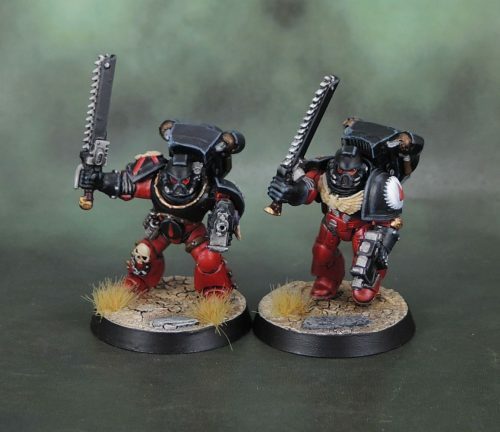 This is because these models were initially planned to represent an option for me to use them as either a Blood Angels successor chapter, or as a models that could be used in a Khornare/World Eaters Chaos Marine force (probably as Khornate Raptors). 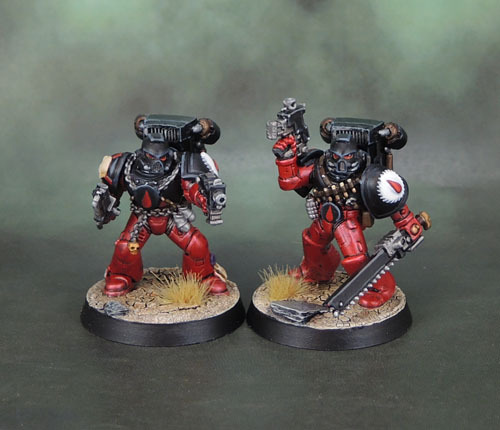 The models are built from a mixture of what was readily available back in that 2005-2008 time period, so Tactical Marine, Assault Marine and Khorne Berserker parts. I think they work just as well (or better) with the black chest and bone aquila. The skull-helmet is a Khorne berserker helm with the “bunny ears” trimmed off. The bare head is the one with the canines, that I figured would work well enough for a non-Blood-Angels-handsome vampire or a chaos marine. The Power fist is from the 2nd Edition chaos close combat sprue. The loyalist purity seals were added later. 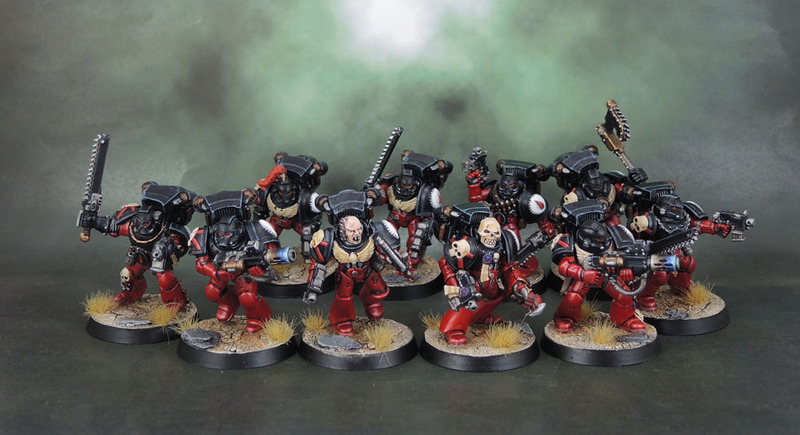 This squad all feature metal “Death Company” shoulder pads from the 2nd edition metal box set from the Codex: Angels of Death release in 1996, so I’d had them for quite some time before this. When I originally planned this dual-use force out in 2005 or 2006 or whenever it was, I wanted to use metal shoulder pads for chapter icons, in much the way I’m now using 3D-printed icons. Because I value consistency for Marine models. The Saltire (cross) on the pads was to be part of the Chapter Icon, rather than something to represent the Death Company. These guys got the saltire with skull, another squad type would get saltire-only, another squad type would get skull -only. Of course, in the intervening decade, I’ve forgotten the entire system I had worked out, so I’m simply calling the Saltire-with-Skull an “Assault” designation. 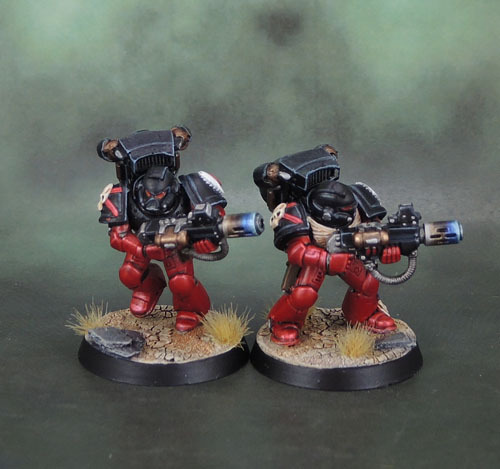 Despite the use of Melta Guns being (briefly) removed as an option for Blood Angels in the 8th Edition index, they’re back in the new Codex, so they’re legal again. (I’d have just used them anyway.) I had some fun with the barrels experimenting with a nice heat discolouration look on the barrels. Another change from the initial models was a change to their Jump Packs. 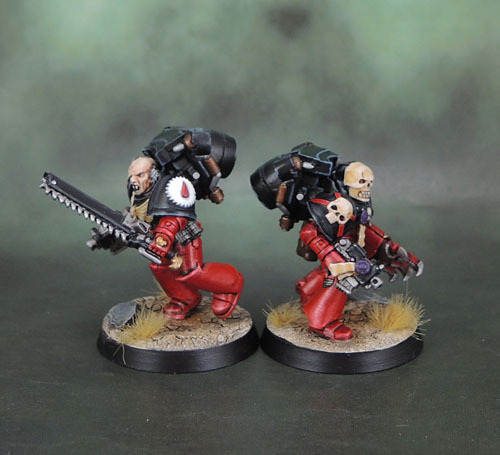 With new products available, I swapped out the original “two thruster” backpacks with these ones which tie them in more strongly with many of the Blood Angels models – particularly the Sanguinary Guard. Chainaxes obviously have no standard place in a Blood Angels force, though they’re very much a weapon that is in character for the Flesh Tearers. In friendly games, I’ll just use the stats taken from the Khorne Berserker entry, and should it ever be an issue, they can just be fancy-looking chainswords instead. 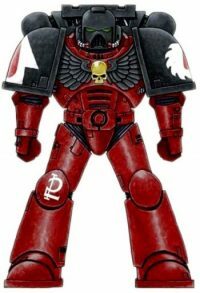 The eventual plan for the Flesh Tearers is for them to be combined with the “proper” Blood Angels as a combined Sons of Sanguinius army. 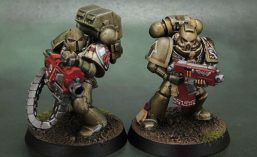 I’m going to completely ignore GW’s rather arbitrary rules on which heroes can influence which troops and eventually paint all of my metal BA characters in their own livery – as well as Gabriel Seth – and simply use them together as one. 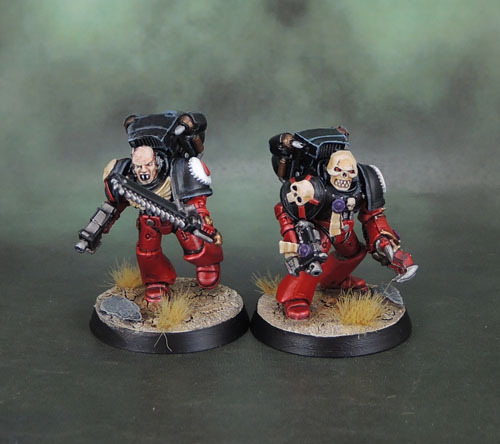 In the meantime, I do want to get the Flesh Tearers to a 2+1 stage on their own before doing the same with the Blood Angels, and them combining the two. I’ve got a Rhino/Razorback in progress that I picked up off Nerdfest on Dakka, and also a hero in progress. So hopefully those both get finished in the next couple of months so I can then begin on the second FT squad (Tactical, probably) and then take it from there! This entry was posted in 40k, Flesh Tearer Space Marines and tagged 40k, Flesh Tearers Space Marines, Warhammer 40000, Warhammer 40k. Bookmark the permalink. Looking great there! I do like the alternate pattern Jump Packs for BA, tho it was a little hard to see what they were in the pics from the front. Excellent use of those Berzerker heads as well. I have a ton of Chainaxes in my Space Wolves and Crimson Thunder (formerly Fleshtearers, but I repainted the insignia because I wanted to be able to chapter-hop). I always just use them as Chainswords, but I should start asking about using Chainaxe Rules for them in casual games. Basically just SG backpacks without the wings, so that gives me spare wings to play with in the future, and also ties them in a bit more with their BA brethren. The chainaxes are one of those “better in this way, not as good in that way” choices, and they fit thematically with quite a few loyalist chapters, so I figure they’ll be fine in friendlies, and if I’m ever playing a more SRS BZNESS game, they can just be counts-as-chainswords. Cool mate, the slight deviation from the official scheme looks better in my book – these guys rock! Thanks Alex, and yeah – that deviation works for me, so I’ll keep on with it for my own models! Great effect on your meltas. Kudos! Thank you! I’m quite pleased with them. Thanks mate, you going Scottish on us here? I’ve just realised – you’re using voice-to-text on some of these comments! Are you reading my blog on the toilet??? Ohhh, these are lovely! I adore the deep, rich red you’ve managed to achieve on them! Extra kudos for the sneaky and effective use of berzerker bitz! Really nice looking. I like the Skull helmed guy. Maybe the enemy would take him out first, but he sure looks cool! Only if they had enough time to react as he swoops in with the roar of his jump pack’s engine!